Welcome to the seventh part of our summer series, introducing the top players in the 2015 recruiting class. Last week we caught up with Orangeburg-Wilkinson (S.C.) defensive lineman Albert Huggins, one of the top at his position in his class. 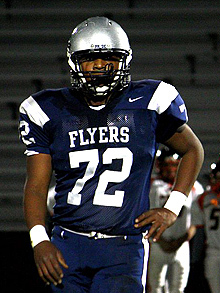 This week we're taking a trip to the east coast, as we catch up with Suffield (Conn.) Academy defensive tackle Christian Wilkins, who checks in at No. 82 in the 2015 24/7 composite rankings. The massive, 6-foot-4-inch, 290 pound defensive tackle holds offers from a bevy of schools, including Boston College, UConn, Florida State, Iowa, Maryland, Ohio State, Penn State, Stanford, and Virginia. Connecticut's top junior only took two visits this summer, one to local Boston College and the other to Columbus to see what Urban Meyer and the Buckeyes have to offer. "I just went to Boston College for a camp since it's so close to home. I thought I performed really well," Wilkins told Eleven Warriors. "The coaches were really impressed with my performance in the one-on-one drills." Wilkins felt he learned a lot from the Boston College coaching staff. He will look to translate what he learned to success on the football field this fall, where he aims to win his third state title. "I felt like they helped me a lot with techniques to stop the run and bat down passes," he said. "I definitely think I improved at the camp." 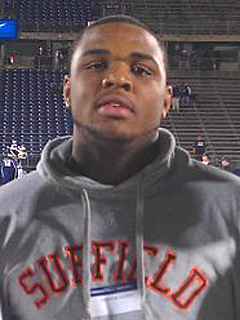 Wilkins' visited Ohio State last week, checking out Columbus for the first time. He enjoyed his time in the Buckeye State. "My favorite part of the trip was just getting a feel for the football program and the great tradition Ohio State offers," he told Eleven Warriors. "I got to watch the team practice, take a tour of the campus, have a conversation with Coach [Urban] Meyer, and I also got to know the other coaches." The standout defensive tackle enjoyed his opportunity to sit down and chat with Meyer, widely regarded as one of college football's best coaches. "It went really well. He's a nice, down to earth, really cool dude," he said. "We're just trying to build a relationship right now. We just talked about my recruitment, the OSU football program, and just about football in general." He didn't have much contact with the OSU coaching staff leading up to the visit, but he expects that to change very soon. "We talked when they offered me and when we were setting up the visit," he told Eleven Warriors. "I think we'll start communicating a lot more now that I've visited and football season is about to start." He doesn't have many visits planned for the fall. "Just Boston College really because it's so close to home," he said. "I'm going to try to do as many visits as possible." Despite growing up very close to the Boston College campus, he's not a huge Eagles fan. "I didn't really root for a specific team growing up," Wilkins said. "I did like watching Boston College because they were the local team, but I never had a main team." Wilkins does not have any leaders or schools standing out at this point early in the recruiting process. "I'm just letting things play our right now," he said. "I'm going to start narrowing my list in the winter once most of the schools that are planning on offering have offered." There is currently no timetable for a decision either. "I'm just going to decide when I feel I'm ready," he added. "I don't want to be one of the guys who commits, then de-commits multiple times. When I commit I want to stick with the school I commit to." When he sits down to make his decision, multiple factors will go into his thought process. "I want to go to a place I feel comfortable. Like a home away from home," he said. "I also want to go to a place where I can win championships and get a good education for my post-football life." The star tackle wants to make as many trips as possible this fall and winter, but only has the planned visit Boston College. Right now he is focused on leading his high school team to their third consecutive state title. "I've been fortunate to win two already and I want to win more," Wilkins said. "I also want to be a leader on my team."